An idea conceptualized in the book, “Built to Last: Successful Habits of Visionary Companies” by Phil Collins and Jerry Porras, captivated, invigorated and permeated corporate America when it was released in 2009. And that idea was the BHAG or Big Hairy Audacious Goal. A BHAG is a long-term goal that changes the very nature of a business’ existence. BHAGs are big, bold, exciting and tangible. They are more powerful than regular long-and short-term goals, typically requiring a 10- to 30-year commitment. In short, BHAGs aren’t for the fainthearted. They require breakthrough thinking, courageous action, and sustained resolve. Still today, a lot of leaders talk about establishing BHAGs, a few bake them into their strategic plans, but few execute against them for the simple reason that organizations favor the status quo. Because let’s be honest, people favor the status quo. 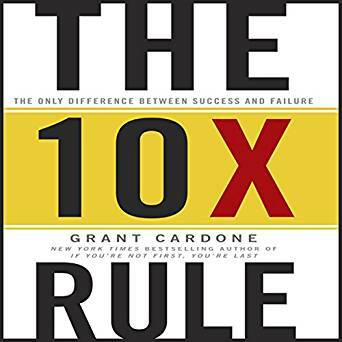 The 10X Rule is like the BHAG concept in that it requires extraordinarily big thinking and exceptionally high levels of action and commitment. The Big Idea in The 10X Rule? Think Bigger and Do More—10 times more than anyone else. And while the BHAG introduced in “Built to Last” is about building landmark companies, the 10X Rule is about achieving dreams—your dreams. What if every person established five 10X goals for their lives? What if we each chose just one or two to work on? Where would our lives be today? Where would our communities be today? Where would our children be tomorrow? The possibilities are inspiring. You may believe this; you may not. If you don’t, don’t read this book—you’ll find the author tiresome and his words irritating. This is a book of extreme action for people who want to aim for extreme success—no, this is a book for people who fundamentally believe in the power of themselves, the power of the human spirit, and need some inspiration, ideas, and real stories to move them to action. There’s a lot of insightful and intriguing content in The10X Rule (including a list of 32 characteristics that successful people embody) but everything points back to the two main tenets: Think Bigger. Do More. Cardone’s words feed right into my beliefs and mindset so, much as I could try, you’re not going to get a balanced review from me. If I have one beef it is the chapter on customer satisfaction—Cardone’s assertions are just not well thought out. He states how customer satisfaction is not the right measure; that gaining more customers is. Then goes on to say he always over-delivers to customers which, of course, drives customer delight. “Customer satisfaction” is a word of many meanings depending on one’s background and training. He’d do well by avoiding this topic entirely or making his point differently. Overall, I was inspired by what Cardone had to say just like I was energized and inspired by the BHAG that came before it. This is a book for people with big dreams. And it’s a book for those who are tireless to make them happen.